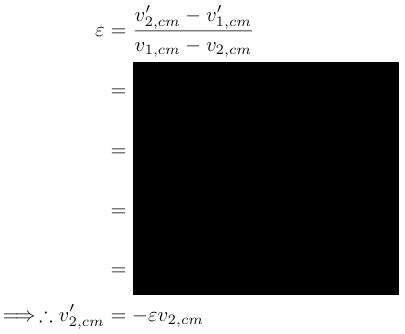 It is best to transform the inertial frame of reference of such that it's at rest ( i.e., ) and accordingly adjust the relative velocity of , which is , in order to accommodate this transformation. That is, the "before and after" mass is conserved as well as energy and momentum are conserved for the condition where there is no net external force applied to the "Center of Mass Frame" system, . 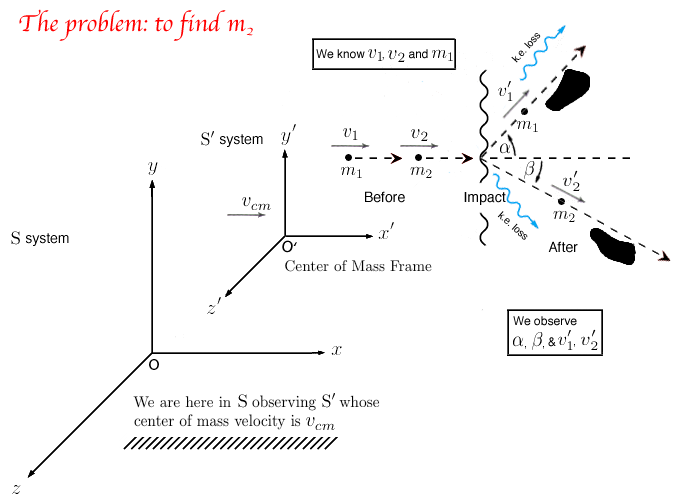 However, some energy is generally dissipated or lost in any collision(s) between masses where this lost k.e. 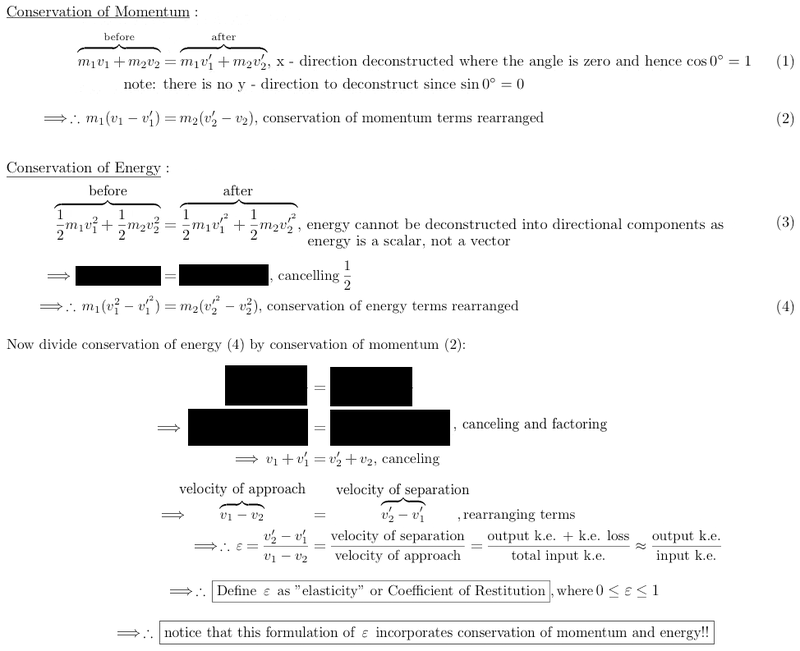 ( kinetic energy ) is found in body distortion, internal molecular or atomic motion, heat, sound, radiation and so forth. 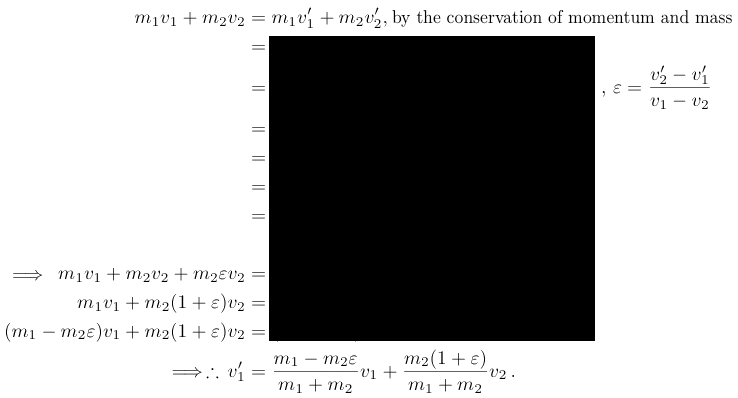 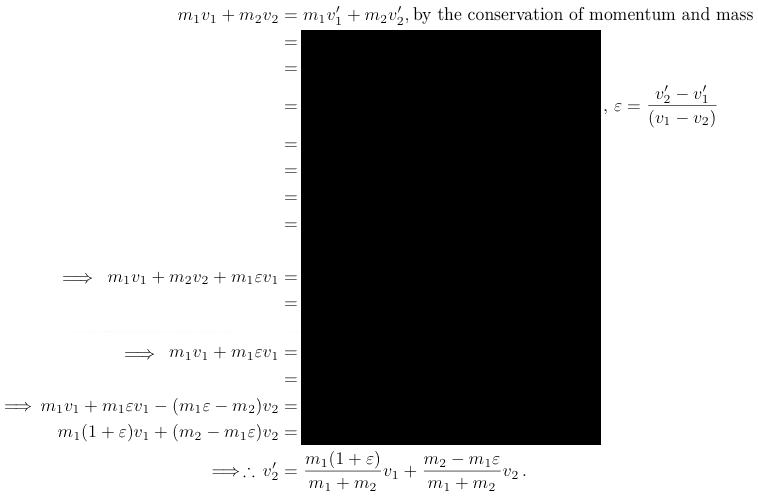 notice: both mass and momentum are conserved. 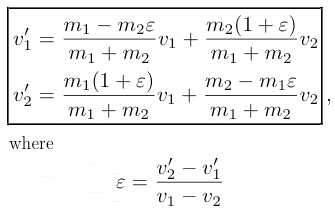 where Newton's 3rd Law of Motion of opposite but not necessarily equal velocities is modified owing to , coefficient of restitution. 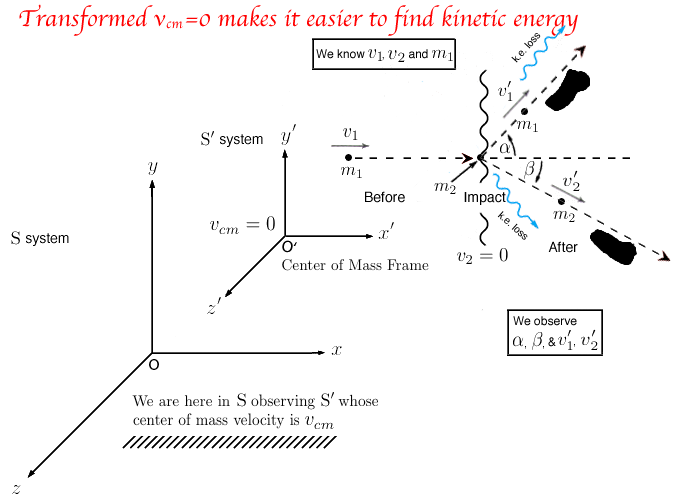 What this signifies is that for any system of particles the maximum energy loss will never be more than the kinetic energy of its center of mass frame which is equivalent to the kinetic energy of the particles contained within the center of mass frame itself. 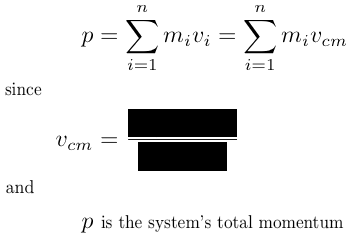 note: see above: § Definitions - (vi). 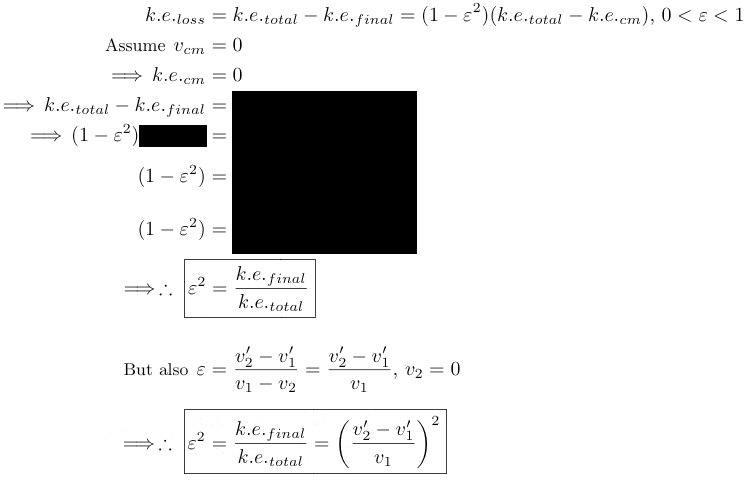 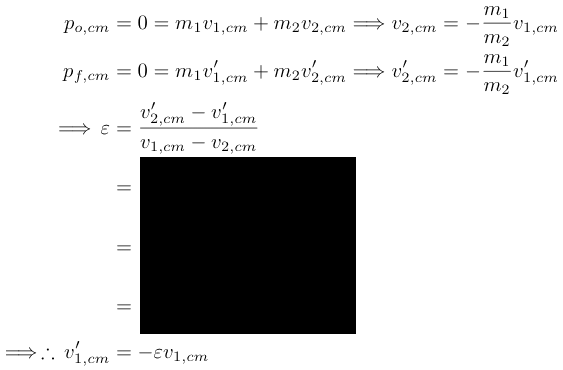 Maximum kinetic energy loss of a system of particles. 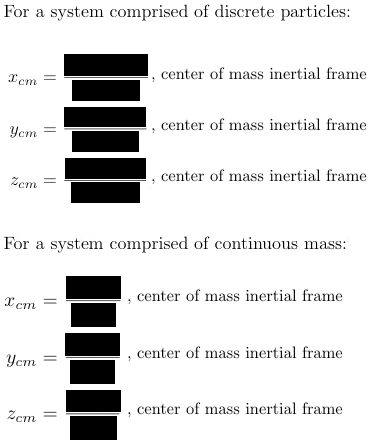 It is best to transform the center of mass inertial frame of reference so that it's at rest ( i.e., = 0 ) and accordingly adjust the relative velocity of which is to accommodate this transformation while maintaining .